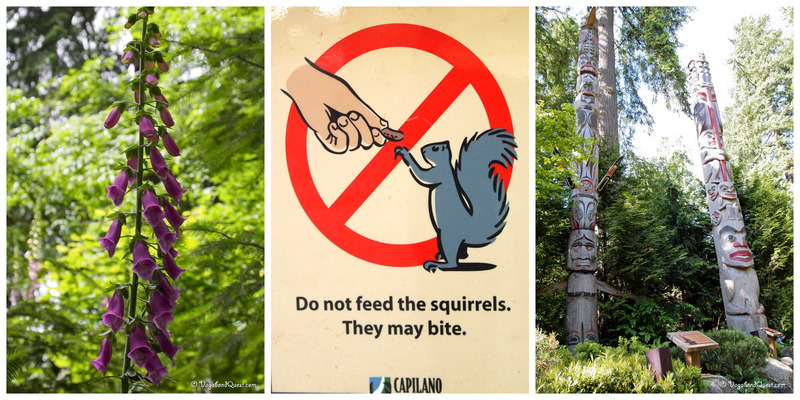 Vancouver is blessed by beautiful nature all around and within it. Just a few minutes drive from downtown to the north, passing through Stanley Park, you’ll find the Capilano Suspension Bridge. 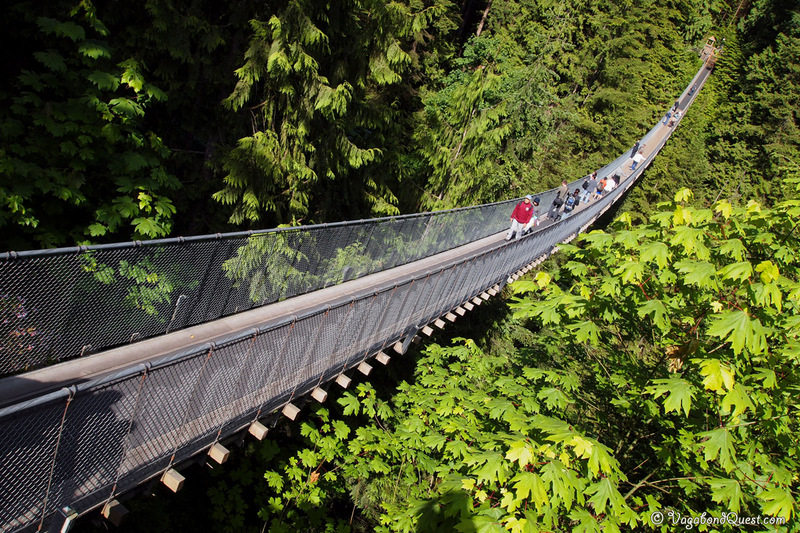 It’s a 450 foot (137 m) long bridge crossing Capilano Canyon. 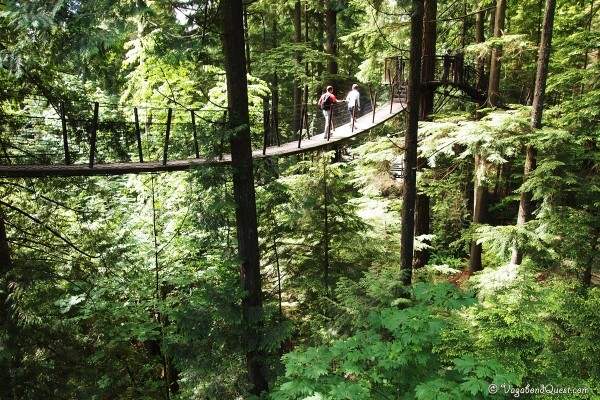 This bridge was originally built in 1889 of hemp rope and cedar planks. Why did they build the bridge? To get to the other side, eh! Now the bridge is made of reinforced steel anchored in over 100 tons of concrete. Very safe, but thrilling to cross nevertheless! Ideal for adults and children as well. Don’t just walk straight to the other end, the view here is gorgeous. With the Capilano River flowing 230 feet (70 m) under you, and tall pine trees along the sides of the canyon. I guess we can spend as much time as we like on the top of the bridge. Well, as long as the park is open. 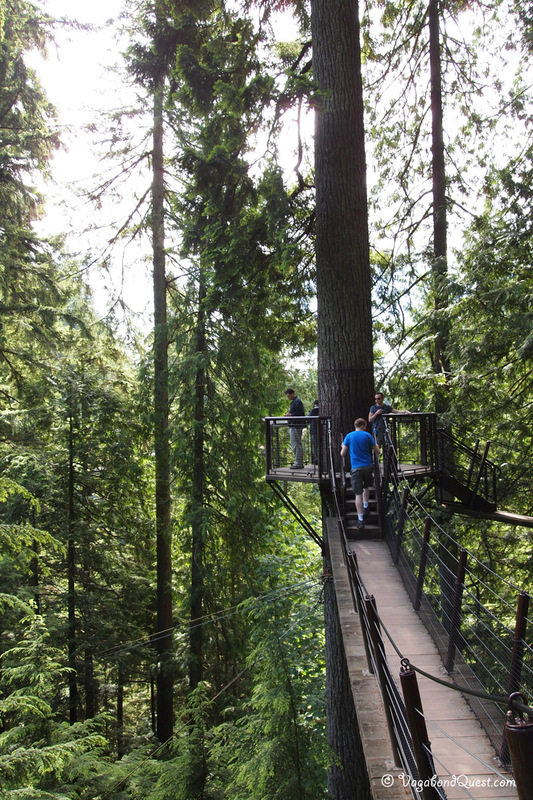 This park also has the Treetops Adventure. 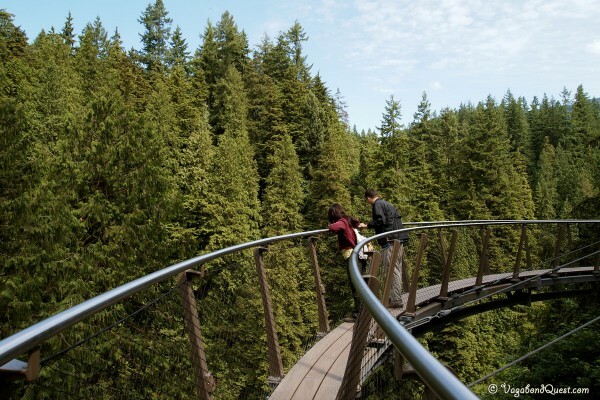 Imagine climbing halfway up the tallest pine tree in the park, reaching 100 feet (30 m) high, and walking along boardwalks and swinging bridges from tree to tree. Now that you have the forest all around you, including underneath you, you can see and feel the forest more deeply and richly. Also, it’s just cool to be so high up like this. 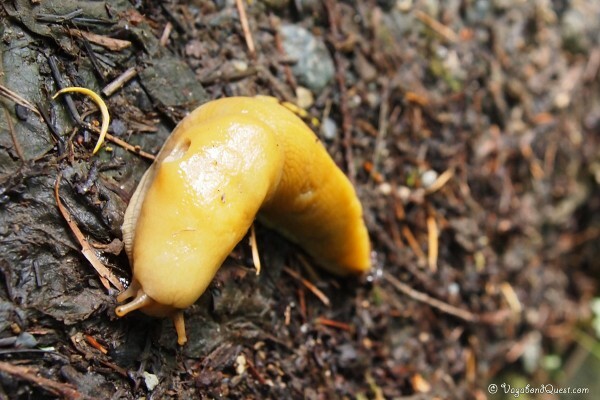 When you’re back on the ground, try to spot some banana slugs! As the name suggests, they are huge slugs in yellow-banana colour! My favorite part of the park is the one year old Cliffwalk! Not for families? Wrong! This has got the be the safest cliff walk in the world. The path is really high and narrow, hanging off the side of the cliff, but the structure is really strong and the see through fence is high, so it’s super safe! 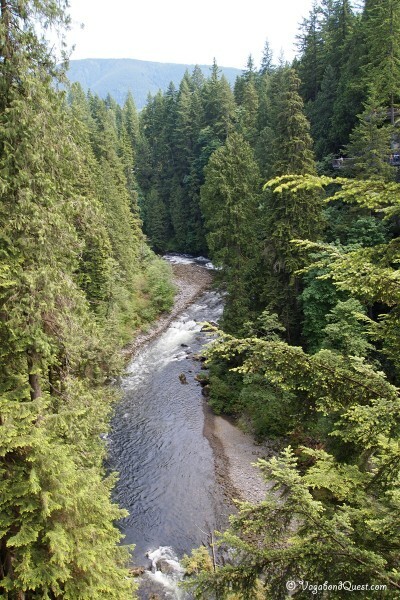 You get an amazing view to the river, and down the cliff wall at the same time. 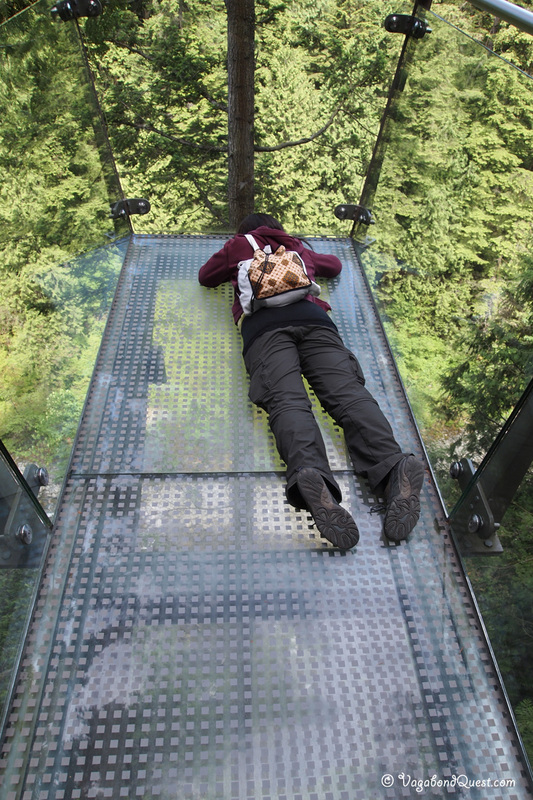 And believe it or not, there are several glass floors in this cliff walk so you can look straight down to the canyon! Pretty cool, eh? Back to the main suspension bridge. I forgot to test how quickly I could make it across to the other side. It tends to bounce around when there are a lot of people crossing and get difficult to walk. Here are some possible challenges: balancing on the swaying bridge, dodging other people on the bridge, or running away from the park guard trying to warn you not to run on the bridge. But then, that might motivate you to run even faster! Anyway, if you do that, tell me your record! « 5 Summertime Adventures in Whistler, B.C. Hey! That’s my backyard, where I had the black bear in my garbage. I live just up the hill from the suspension bridge! Andrea´s last post…Booting it down the Oregon Coast. Oh NO NO NO NO AND NO! I would not cross that suspension bridge if you paid me! haha. You have brains in your head and feet in your shoes. You can steer yourself in any direction you choose. Such is the impact of traveling and you find always a new story to hear about and great experiences to share. Thanks for sharing this informational piece of information. We are heading to Vancouver in September this looks like a blast!